Michael Grabner became the first Ranger to score a hat trick this season, and the Blueshirts coasted to a surprisingly lopsided 6-1 win over the Tampa Bay Lightning Sunday night at The Garden. Antti Raanta made 31 saves and notched his 2nd win of the season in as many appearances. Rick Nash, Jimmy Vesey, and J.T. Miller had the other New York goals. After a scoreless 1st period, the Rangers exploded for three goals in a 2:19 span early in the 2nd period. Nash beat Ben Bishop on a breakaway to make it 1-0 New York 4:45 into the period. Grabner scored his first goal of the game at 6:42, finishing off a display of nice passing by the Rangers. Hayes passed to Brady Skjei, who passed to Grabner, who scored to make it 2-0. 22 seconds later, Vesey, on a pass from Nash, made it 3-0 at 7:04. And later in the 2nd period, Miller scored his 3rd goal of the season, at 18:10, to make it 4-0 New York. In the 3rd period, Grabner scored twice, at 9:02 and at 14:47. Grabner now has five goals on the season, tied with Vesey for tops on the Rangers. Steven Stamkos scored Tampa Bay’s only goal, trickling a shot past Raanta at 16:36. Miller finished with a goal and two assists, while Kevin Hayes had three assists on the night. And Ryan McDonagh had an assist, to extend his streak of games with an assist to seven games. The Rangers [now 6-3-0, 12 pts] host the St. Louis Blues Tuesday night at The Garden. Jeff Skinner had two goals and an assist as the Carolina Hurricanes beat the Rangers, 3-2, Friday night in Raleigh, despite two goals from Mats Zuccarello. The loss snapped a three-game winning streak for the Blueshirts. It was Carolina’s home opener after starting the season with six straight road games. Zuccarello gave the Rangers a 1-0 lead 8:31 into the 1st period, scoring a power play goal when he flipped the puck over Carolina goaltender Cam Ward, who was sprawled out on the ice after making an initial save. Skinner tied the game minutes later, skating from out behind the net with the puck and beating Henrik Lundqvist at 12:34 to make it 1-1. Skinner’s 2nd goal of the game, just 33 seconds into the 2nd period, made it 2-1 Carolina. But the Rangers answered. Midway through the period, Zuccarello, standing at the Carolina blue line, knocked down Ryan McDonagh‘s saucer pass, skated in on Ward and scored at 12:17 to make it 2-2. Carolina took the lead for good in the closing seconds of the period; With McDonagh in the penalty box after a tripping penalty, Skinner blasted a slapshot from the right faceoff circle that was deflected in by Bryan Bickell at 19:59 to make it 3-2. The fans, thinking Skinner had scored a hat trick, showered the ice with hats. Ward made 28 saves for the win. Lundqvist finished with 18 saves. The Rangers [now 5-3-0, 10 pts] host the Tampa Bay Lightning Sunday night at The Garden. Brandon Pirri scored two goals as the Rangers roared back from a 2-0 deficit to beat the Bruins, 5-2, Wednesday night at The Garden. Rick Nash, Kevin Hayes, and Jimmy Vesey had the other New York goals. Henrik Lundqvist made 29 saves for his 4th win of the season. The Bruins jumped out to a 1-0 lead just ten seconds into the game when David Pastrnak slipped the puck through Lundqvist’s pads for a goal. Austin Czarnik scored his first NHL goal at the 14:44 mark of the 1st period, when his shot tricked past Lundqvist and in for a goal. In the 2nd period, the Rangers’ offense came alive. On the power play, Nash got his own rebound and flipped the puck over Boston net minder Zane McIntyre, who was making his first NHL start. Nash’s goal, at 9:16, made it 2-1. Kevin Hayes tied the game 2-2 with 3:25 to play in the period. Jesper Fast made a great pass from behind the net to Hayes, who actually bounced the puck off McIntyre’s back and in for the goal. The New York power play converted again late in the period. Pirri’s wrist shot from the top of the right faceoff circle gave the Blueshirts a 3-2 lead with just 36 seconds to play in the period. Pirri took a pass from J.T. Miller and let it fly, giving the Rangers their 2nd power play goal of the period. In the 3rd period, the Blueshirts widened their lead. Marc Staal‘s shot bounced off the end boards, and Pirri put the rebound into a wide-open net at 2:23 to make it 4-2. Vesey made it 5-2 43 seconds later, deflecting a perfect pass from Nash in for his 4th goal of the season. The Rangers [now 5-2-0, 10 pts] play the Carolina Hurricanes Friday night in Raleigh. The New York Rangers will be a sore but happy bunch Monday morning. The Blueshirts blocked 28 shots, and Dan Girardi‘s goal in the early minutes of the 3rd period held up, as the Rangers beat Arizona, 3-2, Sunday night at The Garden. It marked two wins in a row for the Rangers, who beat the Capitals in Washington Saturday, 4-2. Henrik Lundqvist made 27 saves in the win. Radim Vrbata scored just 33 seconds into the game to give the Coyotes a 1-0 lead before most of the fans sat down in their seats. But Josh Jooris tied the game up at the 12:13 mark of the period, taking a great pass from Michael Grabner and slipping the puck past Arizona goaltender Louis Domingue. J.T. Miller gave the Blueshirts a 2-1 lead 5:45 into the 2nd period. Miller deflected Ryan McDonagh‘s blistering slapshot from just inside the blue line past Domingue for a power play goal. The New York power play was 1-for-2 on the night. But Vrbata’s 2nd goal of the game, 16:18 into the 2nd, made it 2-2. In the 3rd, Brady Skjei skated the puck into the Coyotes end and passed the puck off the boards to Girardi, whose slapshot beat Domingue at 1:55 of the 3rd. It was Girardi’s first game and first goal of the season. Sunday also marked Oscar Lindberg‘s first game of the season, as the winger returned following recovery from hip surgery. Chris Kreider missed the game with neck spasms, and was replaced on the team’s top line by Miller. The Rangers [now 4-2-0, 8 pts] host the Boston Bruins Wednesday night at The Garden. When Mika Zibanejad scored just 69 seconds into the game Wednesday night, you thought it was going to be one of those magical, fun nights at The Garden. That was pretty much the end of the magic and fun, though. The Rangers went 0-for-4 on the power play, failed to convert on several breakaways, and Henrik Lundqvist‘s misplay of a puck behind the net in the 3rd period led to the game-winning Detroit goal, as the Red Wings edged the Blueshirts, 2-1. Detroit backup goaltender Jimmy Howard made 32 saves for the win, in his first start of the season. Zibanejad deflected a Ryan McDonagh shot past Howard just 1:09 into the 1st period, to give the Rangers an early 1-0 lead. In the 2nd period, with Adam Clendening in the penalty box for a boarding penalty, Thomas Vanek scored a power play goal 6:15 into the period to tie the game, 1-1. Michael Grabner and Rick Nash each failed to score on breakaway chances during the period, and, despite out-shooting the Red Wings 27-14 in the first two periods, the game remained tied. Then, early in the 3rd period, Lundqvist couldn’t clear the puck from behind the net. Luke Glendening passed the puck to Drew Miller, who scored his first goal of the season 59 seconds into the period, to give Detroit a 2-1 lead. The Rangers’ power play, which had scored goals in two of the team’s first three games, went 0-for-4 on the night, which included a 54-second stretch of a 5-on-3 advantage in the 2nd period. Lundqvist finished with 16 saves. Chris Kreider extended his scoring streak to four games with an assist on the Zibanejad goal. The Rangers (now 2-2-0, 4 pts) play the Capitals in Washington Saturday night. Chris Kreider had a goal and an assist for the third straight game, and Jimmy Vesey scored his first goal as a Blueshirt, as the Rangers held off a late San Jose rally and beat the Sharks, 7-4, Monday night at The Garden. Antti Raanta, in his first game of the season, made 27 saves for the win. Marc Staal, Rick Nash and Kevin Hayes each also had their first goals of the season. Staal gave the Blueshirts a 1-0 lead 12:06 into the 1st period, scoring on a one-timer off a pass from Derek Stepan. But the Sharks tied the score with :58 left in the period, as Logan Couture scored a power play goal to make it 1-1. In the 2nd, Nash grabbed the puck as it bounced off the end boards and put it past Martin Jones at 4:15, to give the Blueshirts a 2-1 lead. Kreider made it 3-1 midway through the period, scoring a power play goal from a tough angle, past Jones up high, to make it 3-1 at 10:21. Kreider is the first Ranger to start a season with three multi-point games since Bernie Nicholls in 1990. In the 3rd, Brett Burns made it 3-2 with 10:47 to play. But the Rangers responded, scoring two quick goals to make it a three-goal margin. Hayes made it 4-2 at 12:16, and Vesey scored, off a nice pass from Stepan, 21 seconds later at 12:37. Just when you thought the lead was safe, Burns’ 2nd goal of the game, at 13:57, cut it to 5-3, and Joe Pavelski deflected in a shot for a goal at 15:31 to make it 5-4. Pavelski had a goal and three assists on the night. It was back to a one-goal game with 4:29 to go. But Mats Zuccarello and Michael Grabner scored empty net goals in the final two minutes of the game for the final 7-4 margin. Stepan, Zuccarello, and Ryan McDonagh each had two assists on the night. The Rangers [now 2-1-0, 4 pts] host the Detroit Red Wings Wednesday night at The Garden. The Rangers peppered the St. Louis net with 15 shots in the 3rd period Saturday night but could not solve goaltender Carter Hutton, and the Blueshirts fell to the Blues 3-2. Defenseman Dan Girardi left the game in the 2nd period with what was described as a hip flexor injury, and did not return to the game. Chris Kreider scored his 2nd goal in as many games, and lineman Mika Zibanejad scored his first goal of the season. Vladimir Tarasenko gave the Blues a 1-0 lead just 73 seconds into the game, his 3rd goal of the young season, on the team’s first shot of the game, but Kreider evened the game at 5:25 of the 1st, putting a rebound past Hutton. Kreider had seven shots on goal for the 2nd straight game. Paul Stastny made it 2-1 St. Louis with a goal with 2:28 to play in the 1st. And when Alex Pietrangelo scored a power play goal 2:28 into the 2nd period, the Blues had a 3-1 lead. But the Blueshirts answered quickly. Zibanejad flicked a backhand past Hutton 30 seconds later to cut the lead to 3-2. The Rangers would get no closer. Hutton finished with 33 saves. Henrik Lundqvist made 15 saves in the loss. Girardi’s injury affects an already-depleted Rangers’ defensive corps. Kevin Klein is listed as day-to-day with a back injury and as missed the team’s first two games. Adam Clendening and Nick Holden each logged big minutes Saturday, and Girardi’s injury could mean playing time for Dylan McIlrath, who was a healthy scratch Saturday. 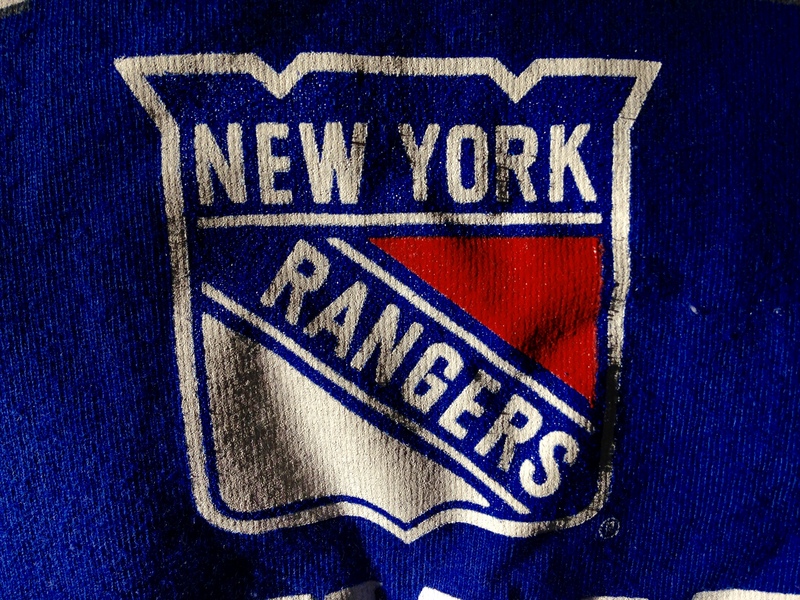 The Rangers [now 1-1-0, 2 pts] host the San Jose Sharks Monday night at The Garden. Pavel Buchnevich‘s laser beam of a pass up the ice to Chris Kreider was the one highlight clip to watch multiple times. Kreider scored to give the Rangers a 3-2 lead midway through the 3rd. Amazing how balanced the minutes were between the 12 forwards, from Mats Zuccarello‘s 17:46 to Michael Grabner‘s 10:47. Nice to see so many of the new Rangers make a contribution in Game #1. Brandon Pirri had a goal and an assist. Mika Zibanejad had two assists. Grabner scored the game’s first goal. Buchnevich had the memorable assist. Nick Holden added an assist. Henrik Lundqvist looked good throughout. Despite squandering a 2-0 lead in the first few minutes of the 3rd period, the Blueshirts showed resolve and didn’t panic when the Islanders tied the game 2-all. There have been games over the years when that wouldn’t have happened. One game does not a season make, but last night’s win was a good one for the Rangers and has to help build a tiny bit of confidence in the locker room. The Rangers broke open a 2-2 game with three goals in the final eleven minutes to beat the Islanders Thursday night at The Garden, 5-3, in the season opener for both teams. Seven players made their debut for the Blueshirts and five of them made it onto the scoresheet. Michael Grabner scored the team’s first goal. Brandon Pirri had a goal and an assist. Mika Zibanejad had two assists, and Pavel Buchnevich and Nick Holden each added an assist. The Blueshirts held a 2-0 lead going into the 3rd period, on goals from Grabner [at 13:41 of the 1st period] and Mats Zuccarello [at 17:41 of the 2nd]. But the Islanders tied the game up early in the 3rd, on goals from Nick Leddy and Cal Clutterbuck. The Rangers regained the lead at the 9:45 mark of the 3rd. Chris Kreider took a laser beam of an up-ice pass from Buchnevich and scored to make it 3-2. Pirri’s power play goal at 16:11 made it 4-2, and J.T. Miller‘s empty net goal at 17:37 made it 5-2. Brock Nelson‘s goal at 18:25 of the 3rd period provided the final 5-3 margin. Henrik Lundqvist made 25 saves en route to his 375th career NHL win, moving him into 14th place overall in league history. The Rangers [now 1-0-0, 2 pts] play the Blues in St. Louis Saturday night. 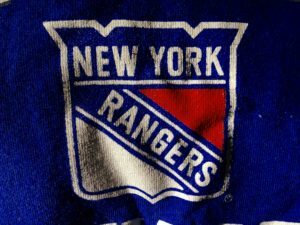 When the Rangers were eliminated from the playoffs last April, by the eventual Stanley Cup champion Pittsburgh Penguins, many wondered whether the Blueshirts’ window to win a Stanley Cup was closing. Rather than stand pat, the team had a busy off-season. In the process, two popular players, the one with the most goals in 2015-16 [Derick Brassard] and the one with the most assists last season [Keith Yandle] are gone. While there are still aging players under long-term contracts, the team added speed, youth, and promise. Leaving Rangers fans feeling cautiously optimistic, going into the 2016-17 season. The biggest deal in the off-season was the trade that send Brassard to the Ottawa Senators for center Mika Zibanejad. In August, the Blueshirts ‘won’ the Jimmy Vesey sweepstakes, convincing the highly-touted free agent forward to sign with the team. The team signed other free agents, including forward Brandon Pirri, who made quite an impression in the pre-season, forcing the team to make room for him on the roster. Others who are not back from 2015-16 include Dan Boyle, Eric Staal, Viktor Stalberg, and Dominic Moore. But things are not all sweetness and light. The defense and special teams would have to be called the team’s biggest concerns. It may be too much to expect Ryan McDonagh, Marc Staal AND Dan Girardi to all have bounceback seasons. Someone – perhaps Brady Skjei – will have to fill Yandle’s skates. with Michael Grabner as the 13th forward. Oscar Lindberg had hip surgery in the off-season, and a move would have to be made when he becomes healthy. with Dylan McIlrath and Adam Clendening in the mix. Henrik Lundqvist remains one of the league’s premier goaltenders. As long as Lundqvist is between the pipes, the Rangers have a chance for a magical season. The popular Antti Raanta is back as the backup. If players like Zibanejad, Vesey and Buchnevich make a splash, players like Zuccarello and Miller continue to grow and improve, players like Nash, McDonagh and Girardi return to form, and if Lundqvist plays like Lundqvist, it could be a fun year to follow the Rangers.